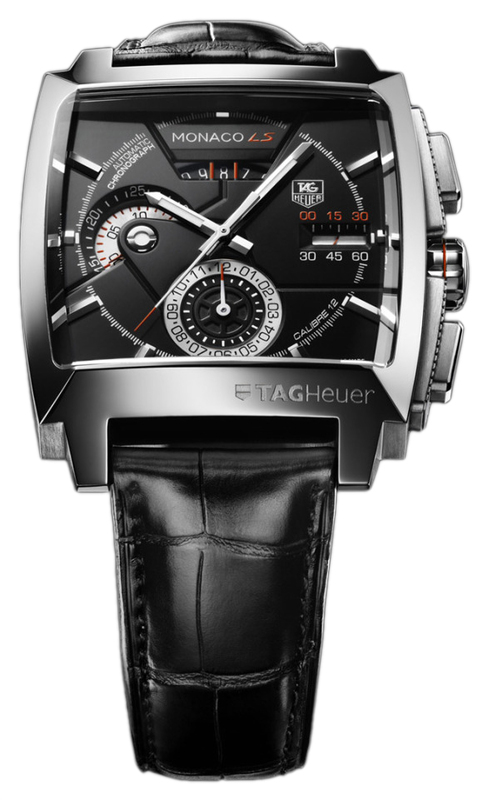 The first thing you will notice about Tag Heuer’s CAL2110.FC6257, is the visual complexity. The second thing you will notice is how much this watch wants to look like the dash of a race car, but hasn’t quite decided on which one. The blocky housing looks like a dash, and the slight distortion from the bevel cut of the scratch resistant sapphire crystal lens evokes parallax errors (honestly officer, I was sure I was doing the limit). The white sub-dials with black markings and numerals are reminiscent of the sports package you keep talking yourself out of. But the overall first impression is one of an overwhelming amount of data. Consequently, permit me to guide you through the face so that you can properly assess what it is offering. At the twelve o clock position, just below the ‘Monaco LS’, and inset into a shape that looks like the gear monitor of an old Buick, complete with a red line to mark the current gear, is the date. It allows you to see not only the present date, but the dates of the days around it–in case you forgot what they might be. At the six o’ clock position, looking like a pressure gauge, is an hours sub-clock for the chronograph function. I’ve always found it ironic to have two hour faces, but that is the way of chronograph wristwatches–the ability to measure the present hour and the number of hours since a time without doing any math. Shifting our attention to the nine o’ clock position, looking something like a tachometer, is a semicircular gauge marking off the minutes. Note it has two rows of numbers. Then, you drift your focus over to the three o’ clock position, and looking for all the world like a fuel gauge is a linear measure for seconds. Again, like the minute gauge you are getting double duty as it marks off zero to 29 seconds across the top and 30 to 60 across the bottom. The timepiece, to maximize the inherent redundancy of function offered by the chronograph option, includes a red tipped seconds hand which along with the other pointers for the other gauges neatly finishes out the survey of the common ways to point out numbers on a car dash. The hour and minute hands are inset with luminous markings making this watch still useful in the dark. The leather strap also features an unusual clasp for a leather band. It uses the same sort of deployment scheme normally found on metal watch bands. The biggest drawback to this watch is that the housing seems out-sized for the width of the band. I think it would have been better to have this watch mounted on a more robust leather bracelet, preferably something made of strong belt leather with a width slightly greater than the housing. I would definitely keep the texturing on the present band–it is reminiscent of some tyre tread patterns. I just bought this watch with the metal band and i love it!!! I do not agree that the band should be bigger than the dial. I did not buy a $10.00 redneck watch with the dial snaped on a four inch tackey brown leather band!! Have a great day.